Traversing time and space, and the early space and progressive rock of the 1970's, comes Corsair with their first EP, Alpha Centauri. This Charlottesville (VA) based band rose from a local Black Sabbath tribute band, Mass Sabbath. With this obvious influence, Corsair also counts early AC/DC, Thin Lizzy, Iron Maiden, and Pink Floyd as their peers. The particular influence of Sabbath is a steady undercurrent, but can definitely heard on Beware, the Black Fleet. Corsair adds the ethereal and atmospheric on Last Night on Earth and Space is a Lonely Place to the space rock vibe. Possibly most impressive is the twin guitar performance that occurs throughout. 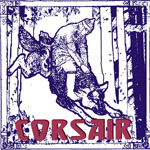 Overall the music is ambitious and creative, with Corsair having a solid foundation in their chosen genre. Production is a little stuffy and, of course, more songs would have made for a better album. Nevertheless, Corsair's Alpha Centauri is a fine debut, and an excellent capsule of the band's talents and imagination for classic prog rock. Very recommended! Corsair's Alpha Centauri is a fine debut, and an excellent capsule of the band's talents and imagination for classic prog rock.